"The reflections of a nineteenth-century, New Hampshire lawyer who left his home to walk to Michigan in the dead of winter may seem nothing more than a bizarre chapter in a catalog of crazy stunts. 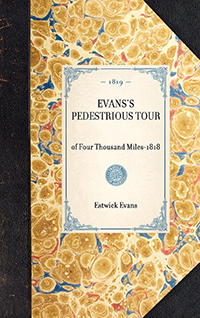 Instead, Estwick Evans's Pedestrious Tour of Four Thousand Miles, originally published in 1819, is a highly detailed, fascinating look at the early Michigan Territory, including the influence the French inhabitants, the new American settlers, and the fur-trade had on the natural and human world. Readers of Evans's work will be reminded of Henry David Thoreau, whose experiment living at Walden post-dates Evans' journey by nearly 40 years. Evans, too, sought to graft the lessons and benefits of nature onto civilized society and articulated a similar concern that society's customs and manners tended to override human principles. Evans left Hopkinton, New Hampshire on February 2, 1818, aiming not only to garner the ""ordinary advantages of travel,"" but also to ""acquire the simplicity, native feelings, and virtues of savage life; to divest myself of factitious habits, prejudices and imperfections of civilization; to become a citizen of the world; and to find, amidst the solitude and grandeur of the western wilds, more correct views of human nature and the true interests of man."" Readers of outdoor literature, including such authors as Henry David Thoreau, John Muir, Jon Krakauer, John McPhee, and Rachel Carson, will joyfully follow Evans on his journey from New Hampshire, through Vermont, along Lake Erie to Detroit, down the Ohio and Mississippi to the Gulf."